We have fundemental cultural differences which neither of us are going to drop. So we continue on our stupid time and resource wasting loop indefintely. Will either side ever move on? I’m all for personal freedom and freedom of expression. But that freedom stops when you invade someone else. Orange Walks, Hibernean Walks, any other walk which is offensive should be banned, not tolerated or even partially funded by the public purse. Personally I think and hope that one day there will be no religion, if you are relgious then you are clinging to out-dated idealogy from days when people lived in and were controlled and manipulated by fear. Thankfully most of the educated world has moved on. All religion is man-made, it’s inherently flawed. Take Catholic priests not being allowed to marry and have children, its flawed because it goes against the most natural of human behaviour and bound to cause internal turmoil for an individual when they are expected to deny what they are. No wonder the Catholic Church is struggling to find priests in the West and largely relies on missionarys from Africa and other third-world countries. Eventually even that will fail as the word becomes smaller and more ediucated. But in the meantime, if you are religious then you cling on to that, I genuinely hope it brings you peace, hope and solace. Just don’t push your views, parades and hatred on to everyone else. Did you see the fantastic final episode of the current series of Game Of Thrones last night? Cersie’s face when the Sept and the High Sparrow was blown to pieces? If you go in to a pub in Glasgow and see an item at the foot of the menu saying A Glasgow Salad. Do not for one moment think this is a beautiful concoction of fruit and veg lovingly dressed and prepared for healthy consumption. Glasgow working class tradition, dictates that we don’t do salad. Our diet is historically influenced by tough working conditions and terrible weather, giving the need to eat carbs for energy or stay warm. A Glasgow Salad is a plate of chips .. Or as you may know them fries .. not to be confused with crisps, which come from bags in the supermarket. We really are an unhealthy lot, heart attack capital of the world, but it’s changing, we are improving, it takes time, generations for the old to die out to be replaced by a more educated youth. As a bhoy in Glasgow, we were poor .. Not going to blab on about it, but 5 boys, mum and dad all living in one bedroom apartment with no indoor toilet facilities is barbaric by today’s standards. Food was mainly the Scottish traditions of mince and tatties, stovies, or in the summer, chips and corn beef. We didn’t need no stinking salad! Well occasionally, my dad would have salad, Lettuce, tomato, onions, carrots and maybe some ham or a boiled egg .. And no dressing in sight. Definitely not exciting in a gastronomic sense! But things change .. Not only do our tastes change, but the availability of food from other parts of the world, influenced by people who have migrated to our city has improved the choice significantly. Take today lunch .. Pictured above .. A delicious combination of Moroccan chickpeas, noodles, sweet potato and coleslaw. We would never had that when I was a kid, it wasn’t even available then and is so much more nutritious than the traditional working mans lunch of a fish supper from the chippy. I spent lunch with a Sikh colleague of mine, just the two of us, so I took the opportunity to ask about the traditional Sikh five articles of faith and if had any difficulties getting his Kirpan through airport security on his weekly commute from London. Like us Scot’s he still holds to his Punjabi traditions but embraces the culture he lives with, loves a beer and wants to go to see Celtic play in The Champions League. I love that, celebrating the old and embracing the new. Like my lunch, Glasgow really is a great big melting pot. Standing at the back of the Chapel, for my friends daughters First Holy Communion. A Catholic mass just seems to last forever! Stand up, kneel down, shake hands with the people around you, go up to receive communion or a blessing, sit down, stand up, sing a hymm and most importantly know the chants to repeat or respond at the right time and heaven help you if you get it wrong. As a lapsed-Catholic, I’m playing my part, trying to join in .. The Lords Prayer as above seemed to be the only thing which hadn’t changed. I’m a cynical person, I question things, back in primary school aged 6, I remember doing those repetitive catechisms over and over then standing up and saying that i didn’t believe in God anyway, explaining that if there was a God then there wouldn’t be hunger or war in the world. So I’m standing there, part of me wondering why am I here? Part of me thinking I don’t believe this nonsense and part of me thinking why do we instill it in our kids and teach them beliefs that the more cynical eye would reject as from a bygone era when shepherds were frightened and needed something to believe in. Or back in the Medieval Ages when kings and charges used the fear of God and the threat of eternal damnation or fire and brimstone to control the populace. All that “Lamb of God” patter .. sorry but I just don’t get it. Can’t they at least try and bring that up to date? But I’m there my friend, and his family, they’ve suffered a recent bereavement with the loss of a daughter and I’m there for him if needed, no doubts, always will be. Heres the thing I like about church and it doesn’t really matter which church you go to .. but it gives a sense of community, of having like-minded people around you, or a focus to have friends around to support you in the bad times or to share the good times. I like that a lot. Part of me even considering going back to my local parish. But I’d need to wear an anti-lighting, protective suit jus in case my presence pisses of the Big Man. It was a lovely day, made some new friends, everyone humbled by the recent happenings, lending support. I was pleased to be there for my pal when needed, isn’t that what life is al about, what friends are for? If having a church service is a reason to sit round and lend support in difficult times then that can only be a good thing. Now it’s 2am, tired but wide awake, knowing I should be asleep but my wee mind too active for that. ps – for the record, I didn’t do religion when bringing up my kids,, they can make their own minds up. The bosses had a meeting today, laying the law down to all staff, telling us that we had to be there for stipulated core hours and 7.5 hours per day. They then went in to state that the lunch break is one hour mandatory. Therefore if you take a 30 minute break for a soup and sandwich then you can’t leave 30 minutes early. Hhhmmmmm … Is that so? Thinks I. Normally, I only take a 30 minute break but don’t leave early. So their effectively winning in my case I’m sure I’m not the only one. 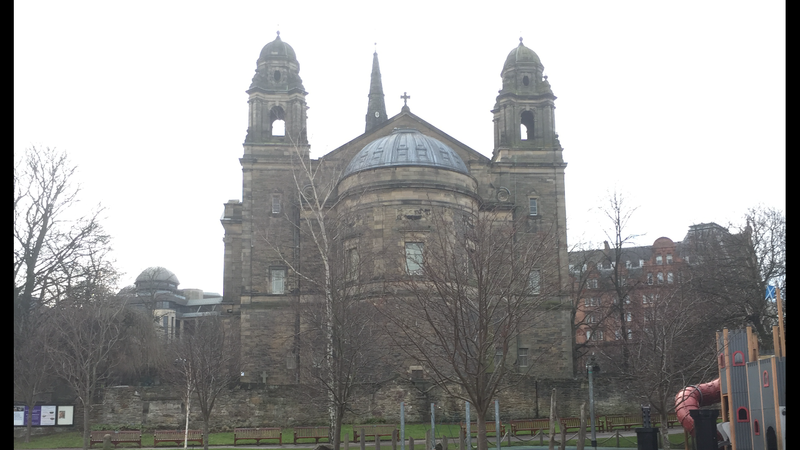 So I took an hours lunch today and wandered round Edinburgh Castle, Princes Gardens and even stopped in at the pretty little Saint Cuthbert’s Church. A few pics below. Isn’t Edinburgh a gorgeous city. I love being here, but really getting pissed off with this particular contract. But isn’t it amazing how you find things out about history with just a little investigation. St Cuthbert’s was a Celtic missionary and founded his church in the spot in the 7th century .. over 1300 years ago. At that time Edinburgh was a fraction of the size it is now and the church still in its current location was separated from the castle by the Nor’Loch. 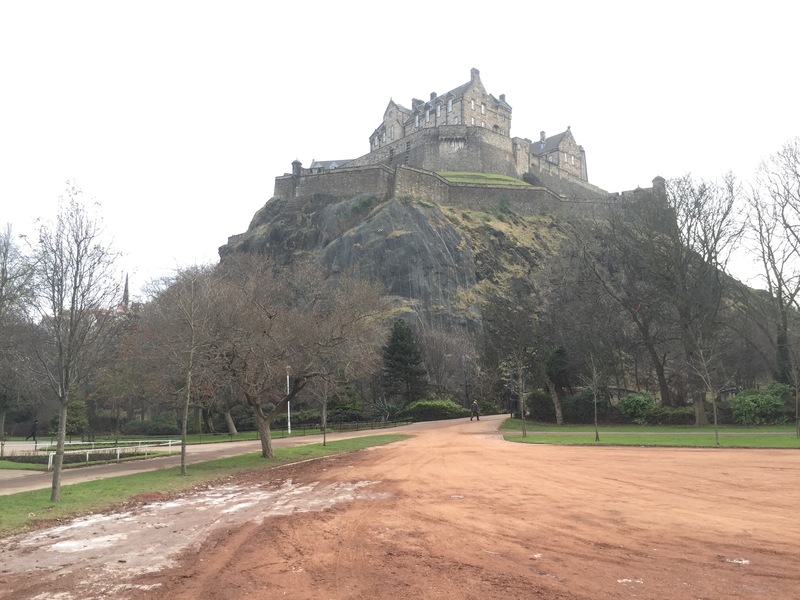 As Edinburgh expanded and the new town of Princes Street, George street etc were created, the Nor’Loch was drained and is now the site of Princes Street Gardens. There are a few other lochs now missing in Edinburgh, the South Loch over at The Meadows and the Gogarloch out beside Gogarburn. 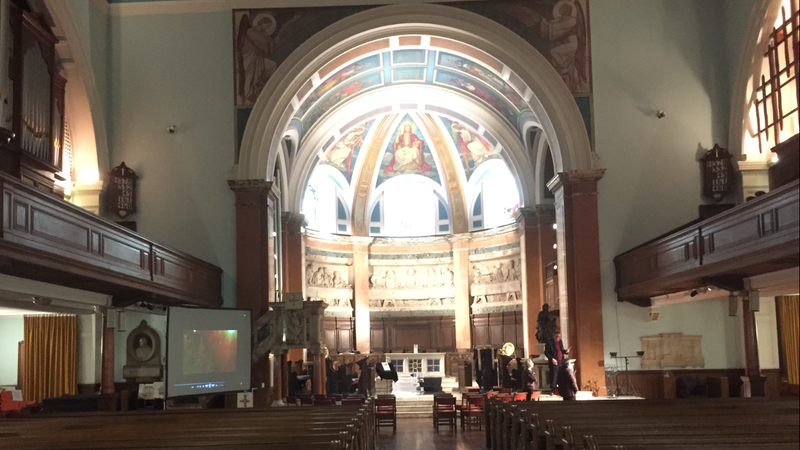 St Cuthbert’s is a beautiful church with an open door policy, I was only in for 10 minutes but the staff were very helpful in providing information. Interestingly the church still stays true to its Celtic theology. I read a little of this on their website today. As a Celtic fan, I kinda like that! Loathe as I am to mention anything to do with the ongoing predicament at The Rangers Football Club. I’ve just read the following fluff article massaging the ego of wannabe director Dave King. Dodgy Dave is laying out his case, attempting to get any fans inside before the upcoming EGM where he wants the current Mike Ashley directors removed and himself and his cohorts installed. I do wonder why it’s taken him to buy shares in this flawed business, probably because he’s the kind of guy who likes spending other people’s money and hesitant to use his own. Now he’s gibbering on about getting “Real Rangers Men” back in the heart of the club .. on the face it, it makes sense to have people who care about the club in place. Really, .. why doesn’t that surprise me? Is that when they had the Anti-Catholic signing policy for over 100 years? Or does he mean when he was a director before Old Rangers went into liquidation because they didn’t pay their taxes? I really hope that King and his ilk don’t succeed in their bid to take over The Rangers boardroom as it would be a backward step for the new club and there would be a reliance on and pandering to the bigot pound. What next the open signing of their sectarian and racist bile? Oh you mean like last Fridays and-board protest outside Ibrox, where the mob even attacked the clubs own employees and the away team fans? Sundays game between Celtic and the new club will be a clear demonstration of the hatred that the supporters of the new club carry in their hearts. This hatred will be compounded by their false victim mentality that they were hard done by and relegated rather accepting that the old club went out of business and the new club was fortunate to be given a start in the fourth tier of Scottish Football. This game at Hampden on Sunday has been simmering for almost 3 years since Old Rangers went into administration and is set to be a hate-fest. Sunday will see increased levels of violence, police incidents, domestic abuse and attendances in the Accident and Emergency wards. If it was up to me, I’d ban it. Yesterday was my wee mums birthday, she’d have been 77 if she hadn’t been taken so cruelly. No grieving, no morbid thoughts, I miss her but know that she’s in a better place. Mum was a darling, a wee Glasgow woman, poor but worked hard and had a huge spirit and sense of fairness. I hope a little of that rubbed off on me. When she passed we had a humanist service as she was non religious or lapsed Catholic if the truth be told. Her heart was full of love for mankind regardless of what colour you were, what religion or where you came from. She’d faced adversity in her own life and wouldn’t tolerate bigoted backward thinking. Anyways, with all the JeSuisChatlie tributes pouring out around the world I came across the following tribute, a cartoon version of John Lennon’s Imagine. Imagine was one of mums favourites and one of her funeral songs. I’m sure she’d love this link. These poor people were targeted for making fun of Islam, Mohammed and the ISIS leadership. How cowardly are these assassins? How pathetic are these people of “faith” when they cannot stand against any criticism without resorting to violence. What God ever preached that violence was acceptable? This isn’t about God or religion, it’s a consequence of blinkered indoctrination that these factions are unable to tolerate anyone else having a different opinion, thought process or lifestyle to the one they choose. That’s bad enough when they live in some middle eastern country, but the problem is that they live amongst us. Yesterday’s assassins were French nationals. The 7/7 bombers in London lived among us as UK nationals. These are disenfranchised people, they feel that they don’t feel that they belong. They have no loyalty to our western countries or our liberties. They believe that they are standing up for some justifiable cause, but nothing justifies attacks on innocent civilians. They want to come here and reap the philosophical benefits of freedom, liberty, free expression to put out their views even if we don’t agree with them as well as the practical benefits of our infrastructure, health services etc but then enforce their opinion upon us. The problem is in the west we are just too liberal. The PC brigade have made us so frightened to speak up in case we are judged as racist or intolerant. Well I don’t care what race, creed, colour, religion, gender or whatever someone is, but as soon as they want to threaten violence against our liberties, support ISIS or join some Jihadist movement, then we need to take action. We need to turn our own dogs against them, the intelligence agencies, covert, nasty, it wouldn’t be my ideal choice, but these guys aren’t playing fair, so neither should we. If there is the merest threat, a hint of conspiration to make threat become real, then round them up, lock them up and show the rest what we won’t accept. Or am I not allowed to say that? On a related note, a young Scottish guy of Pakistani origin was jailed in the UK last year for having downloaded a pamphlet on making bombs. At the time, I believed this was harsh, he was a kid (17)sitting in his bedroom, probably a bit disillusioned with life. At the time I thought locking the kid up was overreacting because there’s one thing reading about it and another thing actually doing anything. Call me idealist, but I think we should be able to read, or say just about anything we want. That it only becomes a crime once intent had been established and steps have been taken to move from ideology to actual threat. But that’s changed, we need to set out what is and isn’t acceptable, we need to be harsh, we need to stop being so liberal when liberty itself is being affected.